The ETH Alumni New England Chapter is honored to welcome ETH President Ralph Eichler & Vice President Research and Corporate Relations Roland Siegwart to the Boston area. For this special occasion we, together with swissnex Boston, would like to invite you to a breakfast event. It will be a great opportunity to hear exciting news about ETH Zurich and have a chance to ask direct question to two important leaders of ETHZ. This is a rare opportunity to meet President Eichler and Prof Siegwart and to hear about recent & future developments of ETH! 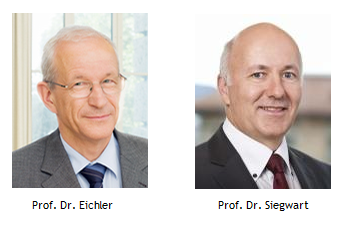 Prof. Dr. Ralph Eichler has been President of ETH Zurich since September 2007 while Prof. Dr. Roland Y. Siegwart has been Vice President Research and Corporate Relations since January 2010. Prof. Dr. Ralph Eichler obtained his doctorate in Physics from ETH Zurich. After being active as a researcher in the USA (Stanford University in California and LAMPF/Los Alamos Meson Physics Facility in Los Alamos/New Mexico) and Germany (DESY/German Electron Synchrotron, Hamburg), as well as at the Institute for Medium Energy Physics at ETH Zurich and as a project manager at Paul Scherrer Institute (PSI), he became a Professor of Physics at ETH Zurich in 1989. His scientific career then took him once again to DESY, this time as spokesman of the international collaboration H1, before he took on leading roles at PSI, firstly as Deputy Director from 1998 to 2002 and then as Director from 2002 to 2007. Ralph Eichler has been President of ETH Zurich since September 2007.Ralph Eichler is a member of the ETH Board and Vice President of ETH Zurich Foundation. He also serves on two Boards of Directors: at Belenos Clean Power Holding Ltd. in Biel and Venture Incubator Ltd. Zug. His other affiliations include memberships of the Swiss Academy of Engineering Sciences (SATW), the Board of Energie Trialog Schweiz, the AXPO Advisory Board on Sustainability, the Swiss Economic Forum and the SLAC/Stanford Linear Accelerator Center’s Scientific Policy Committee. He currently operates as Vice President of the Rectors’ Conference of the Swiss Universities (CRUS). Prof. Dr. Roland Siegwart is Vice President Research and Corporate Relations and Full Professor for Autonomous Systems at ETH Zurich since 2010 and 2006 respectively. After a Master and PhD in Mechanical Engineering at ETH Zurich, he was a postdoctoral fellow at Stanford University, senior researcher at ETH and R&D director at MECOS Traxler AG. From 1996 to 2006 he was Professor for autonomous robots at the EPFL Lausanne, Switzerland and member of the board of directors at the School of Engineering (2002-06). Roland Siegwart is a member of the Swiss Academy of Engineering Sciences, IEEE Fellow and officer of the International Federation of Robotics Research (IFRR). He served as Vice President (2004/05) and AdCom Member (2007/10) of the IEEE Robotics and Automation Society, and was a member of the decision-making body of the German Excellence Initiative. He is co-founder of multiple successful spin-off companies in robotics and related fields and board member of various Swiss institutions and foundations, including CSEM and inspire AG. He is a strong promoter of project based learning as a key asset in engineering education and sustainable industrial alliances for accelerating technology transfer and innovation.